Hundreds of thousands of colourful flowers blooming in our fields. While we don't have tulips we have some fabulous plants including Cleomes Salvias Sunflowers Marigolds Dahlias Cosmos Begonias and more! Plus festival entertainment activities and foods. KaBloom is all about fabulous farm fields filled with hundreds of thousands of colourful flowers plus festival entertainment fun activities and delicious foods. Get ready for a fantastic day out with friends and families - there is so much colour to enjoy. This new and exciting event has just been added to Tesselaar's calendar visitors will be treated to a visual spectacular with sensational fields of colourful blooms. 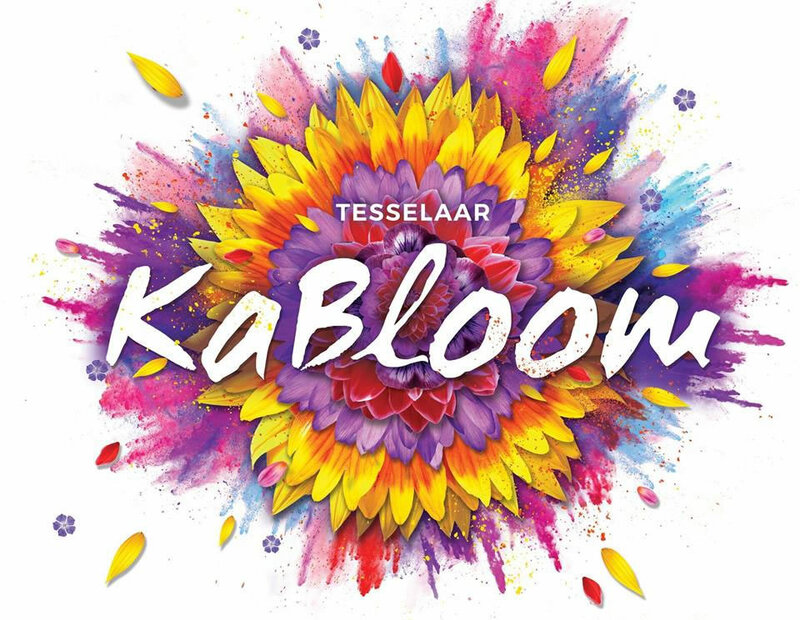 The Tesselaar Tulip Festival has been running for over 60 years and the new sensation of KaBloom builds on the history and blooming bonanza in autumn giving you double the opportunity to enjoy the world of flowers. Breathtaking views and selfie opportunities abound in the fields with delightful Delphiniums fascinating Foxgloves super Snap Dragons beautiful Begonias zingy Zinnia heart warming Hollyhocks sizzling Salvia darling Dahlias cool Cosmos and plenty more. Escape your dull world and revel in the rainbow at Tesselaar flower farm. This is really what KaBloom is all about, the splendour of millions of flowers across five acres of planting in the gorgeous Dandenong Ranges. We have a rainbow of fields filled with marvellous Marigolds, sizzling Salvias, cool Cosmos, colourful Cleomes, pretty Petunias, glorious Gomphrena, charming Celosia and many more. This floral sensation will melt your heart and fill your soul. Every day we have The Circus Firemen performing their world renowned show. Angus and Matilda are The Circus Firemen! They turn up the heat with high energy acrobatics, red hot juggling, and searing Australian comedy. In their death defying finale they balance precariously on 2 ladders while juggling fire! Sure to impress and entertain. It's Firemen themed circus at its very best! Daily at 1pm, this show lasts 45 minutes, but will be remembered forever. Why should we let the performers have all the fun?! Local troupe, Ruccis Circus are running circus workshops from April 6th to 22nd, every day between 11:30am and 2:30pm. Here you can try your hand at juggling, the diablo, mini bikes, learn how to hula hoop and plenty more. Great for all ages and abilities. Easter long weekend is all about chocolate here on the farm. We have a special Easter Egg hunts running daily from Good Friday to Easter Monday (April 19-22). Book early to avoid disappointment! All hunters receive a pack of Cadbury eggs and some bunny ears to hop away with. Admission is just $10 and there is plenty of fun to be had. Our fairy garden plays host to a very special story teller. Teague has long told the tales of the Silvan Glade and all the fae who dwell within it. Carrying the knowledge of the ages she loves to share her stories with the children who can carry on the folklore that the adults think is a bore. She knows they can see the magic long lost to the adults who have been worn down by the dreariness of the human world, but maybe, just maybe, if you listen hard enough she might bring out the child within! Teague tells stories in the magical Fairy Garden daily at 11:30 and 2:30. We have a magical glade in our farm that is home to a village of fairies and their cohorts. Fairies love flowers, so of course they flock here to be among them. Sheltered by magical trees, they sleep or hide during the day and by night they work their magic and tend to the blooms. We are sure you will be enchanted as you pass through. Our famous Flower Bulb Crate Maze is back! A sensation in its first year, visitors enjoyed being lost in the moment as they entered the tricky labyrinth, though we are pretty sure most of them made it out! This year will be a little different, because we like to keep things new and exciting. Test your powers of observation as you tour our garden. Lost within are seven mischievous flower fairies, if you can track them down and write down their special colour you will win a sweet prize. This is a fun activity for all ages and a great one for families or groups. Don't forget to slow down and smell the flowers as you search the beautiful gardens. New this year is a fun and challenging outdoor obstacle course for all to enjoy. Sit back and watch the kids, or show them how it is done! If you don't have kids, then bring your friends and beat the pants off them. The first weekend we will add an extra element of colour and the option of a Colour Run at Noon and 3pm - throw powdered colour at your friends, yourself or strangers as they take on the course. What is a garden without a game or two?! We have a croquet lawn, giant chess, giant jenga, totem tennis, giant naughts and crosses to challenge your friends and family with. With the backdrop of fields of flowers it is a great way to spend part of your day, and prove your prowess. It is not only the fields that are filled with flowers, the gardens are overflowing too. We have romantic Delphiniums, happy Sunflowers, cottage Hollyhocks and colourful Coleus to name just a few planted amongst our perennial beds. Enjoy a nice cuppa and sit enjoying the vistas, taking some special time in your day to relax in a beautiful environment. Our tractor train departs from the Tulip Station regularly, taking in the gorgeous scenery as it tours the farm. Passengers will enjoy audio full of information about how the farm began and how we grow and care for all the flowers. This is a wheelchair friendly ride and people with limited mobility and their carers ride free. Anyone over 4 is $5, under 4 are free of charge. Groups of four are $15. Enjoying so many flowers can be hungry and thirsty work, so it is important to keep fuelled. We have food from around the world, catering for a range of dietary requirements and preferences. Our food stall prices range from $3 to $15. NEW this year is our very flowery, very delicious lavender ice cream that will have you coming back for more! We have a Nursery Shop filled with spring flowering bulbs as well as indoor and outdoor plants to indulge in. Our Fairy Shop is filled with magical wares. Our Lolly Shop is there to tempt you with a myriad of sweet treats. NEW this year is our very own locally made Flower Chocolates which combine delicious flavours with beautiful flowers into an exclusive, mouth watering treat - locally made by renowned chocolatiers Kennedy and Wilson. If you want to take something home for you or someone special, our Souvenir Shop will have just the thing with a sensational range of flower themed gifts. Last, but most definitely not least is our Flower Market, after all who comes to a flower festival without taking some home?! We have gorgeous bunches of seasonal, locally grown blooms to choose from. As you wander our gardens you are bound to notice some breathtaking pieces of art. We have collected these works as part of our Tesselaar Tulip Festival annual Sculpture prize over the past ten years and they have become an important part of our garden. Whether you enjoy food from our vendors, or bring your own picnic we have plenty of areas to put down a rug. We have seating too, it all depends what you are most comfortable as you relax and enjoy the blooms. Times: 10am to 5pm daily.